This was one of the most amazing art sessions in recent memory! 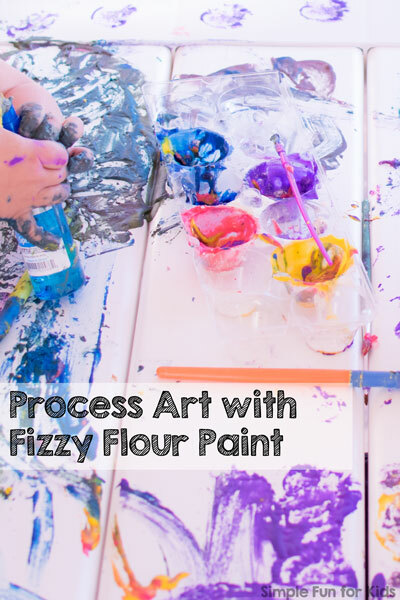 I already posted about the recipe for fizzy flour paint a few weeks ago, but my kids had so much fun with it that I just have to share more photos of their process art with you: Process Art with Fizzy Flour Paint! (E was 5 years and 5 months old. Paper or another surface to paint on. Squeeze bottles and/or spray bottles for the vinegar. We recently bought a white kid-size picnic table. 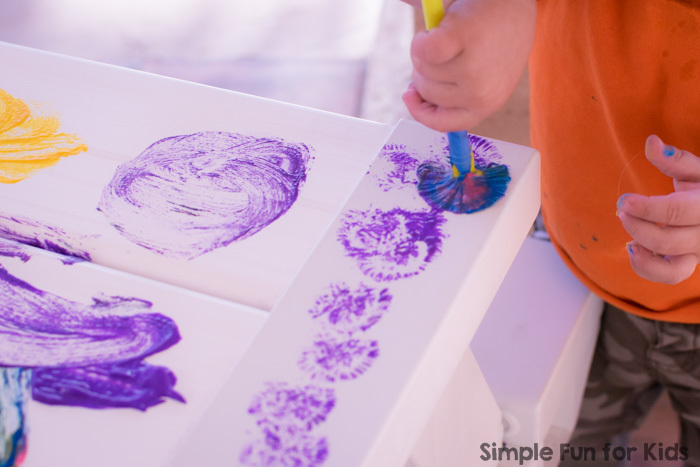 After I’d made the fizzy flour paint, I spent some time trying to find a large sheet of paper to paint on until I realized that the top of the picnic table made a perfect canvas for process art! 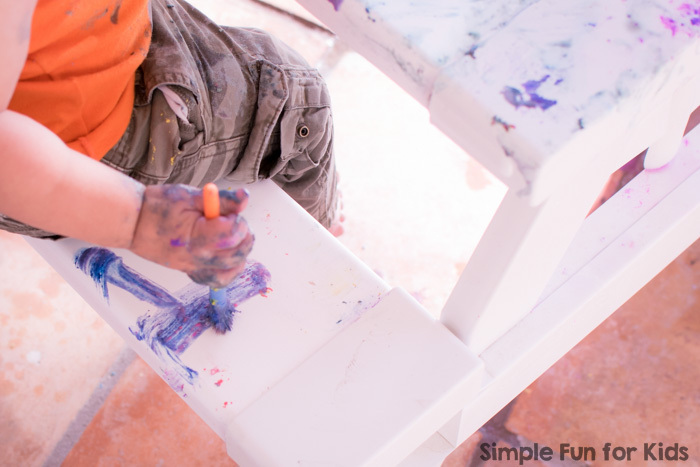 It’s big, white, it doesn’t move around as the kids paint, and it has convenient benches built right in! The benches were another part of this awesome process art canvas! 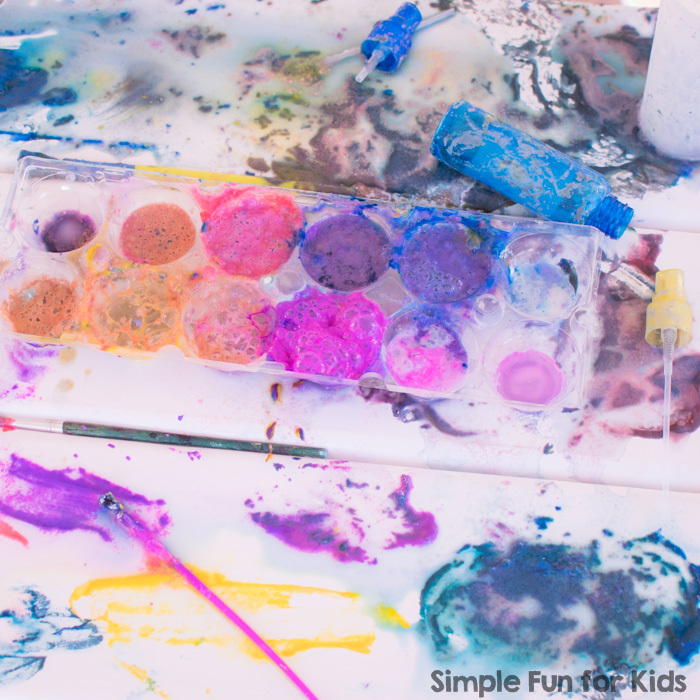 When the kids started losing interest in the paint, I brought out a squeeze bottle and a spray bottle full of vinegar. We’ve played with the baking soda and vinegar reaction many times, and I didn’t expect a different experience this time around. When E started pouring vinegar from the squeeze bottle into the paint that was left in the egg carton, however, I was disappointed, because nothing happened. NOTHING! How could that be? Then, after a few seconds, I finally saw the bubbles come up. Big, beautiful bubbles! And they lasted a really long time! After dish soap and shaving cream, flour is the third material we’ve found that helps the baking soda and vinegar reaction be stronger. 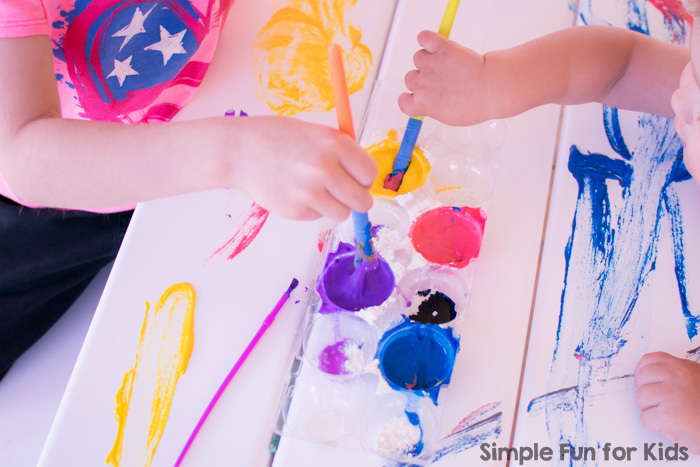 The spray bottle didn’t do much when used for spraying – but when N took off the top and poured the vinegar on the paint on the table, the same strong reaction happened again. 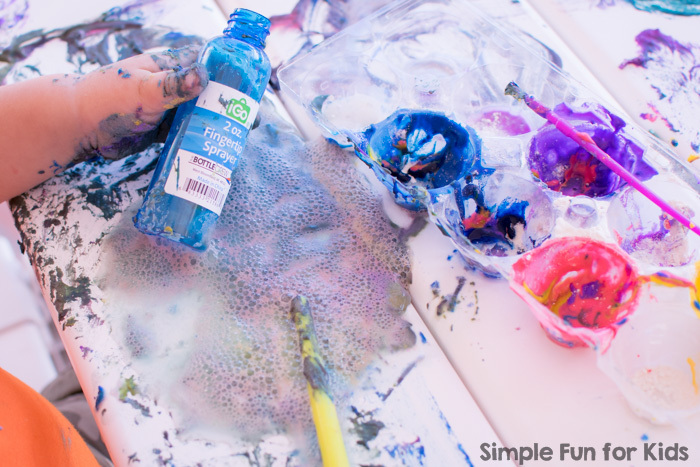 E lost interest at this point, but N spent some more time painting with the fizzy, bubbly paint. 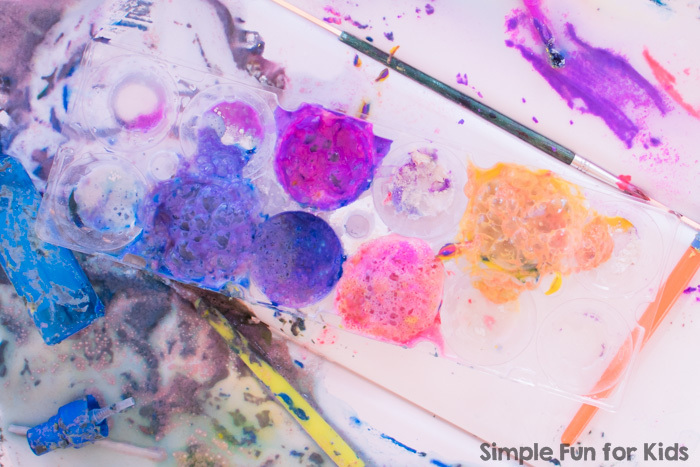 This homemade paint was so much fun! 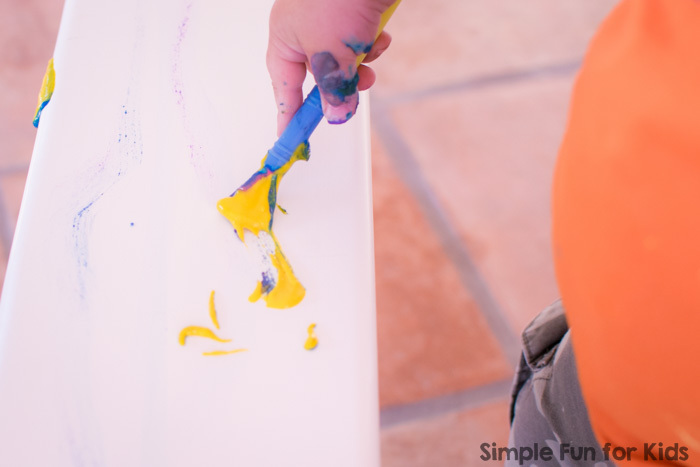 And when it was time for clean up, it was easy to wipe it all off the table top.